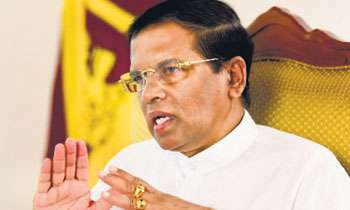 President Maithripala Sirisena today ordered the Coast Conservation Department (CCD) to remove 18 unauthorized structures along the Mirissa beach. CCD Director General B.K. Prabath Chandrakeerthi told the Daily Mirror that the illegal constructions would be removed immediately. In the wake of some Dutch tourists including women being harassed and assaulted on April 8, the CCD identified 18 unauthorized constructions along the Mirissa beach, and they were scheduled to be removed by May 1. However, the CCD had backtracked the removal of these illegal constructions apparently due to the influence of two powerful ministers. However, Mr. Chandrakeerthi had met the President who is also the the Minister of Mahaweli Development & Environment and explained the wrongdoings in these illegal constructions and requested the President to intervene in the matter. Mr. Chandrakeerthi had allegedly received threats from Wasantha Perera, commonly known as Karaoke Wasantha, when demolishing an illegal hotel owned by him in the Unawatuna Beach recently. Meanwhile, law enforcement authorities are to deploy special units before demolishing the illegal constructions, to prevent any sabotage or protests by the Mirissa hoteliers.